The pedagogy of 'a competent child' can be said to require an architecture that is accessible, is scaled and functions for the child, offers flexibility and choice, and treats the child as an equal (and therefore does not patronise). Reggio Emilia have successfully embodied this philosophy in it's architecture, like this one here designed by ZPZ Partners in San Felice. The seemingly simple building utilises a covered colonade providing a natural extension from the interior space into the gardens. Reggio educators are highly concerned about what their school environments teach, embodying the belief that children are resourceful, curious, competent, imaginative, and have a desire to interact with and communicate with others (Rinaldi, 1998: 114). They believe that children can best create meaning and make sense of the world through living in complex, rich environments which support “complex, varied, sustained and changing relationships between people, the world of experience, ideas and the many ways of expressing ideas”, rather than from simplified lessons or learning environments. As Louise Cadwell says of her experience with Reggio education: “no space is marginal, no corner unimportant and each space needs to be alive and open to change” (Cadwell, 1997: 93). Here, the use of skylights, differing artificial lighting, a sensitively chosen colour palette, external courtyards and number of natural materials (masonry and wood), creates a rich and vibrant atmosphere that mediates between the inside and outside, and between private and social spaces. The central square with views to the courtyard garden, bringing a bit of the outside space within. (Left) is the activity spaces, with a stairway leading up to the mezzanine sleeping area. (Right) is the central piazza (or common core) space, showing the courtyard garden at the end of the space. Reggio schools also include aspects of the ‘home’ with objects such as vases of flowers and plants - each are placed meaningfully into the context. Children’s ‘works’ are documented and displayed on documentation panels - communicating clearly to the children, their parents and community respect and value for the children’s abilities and potential. 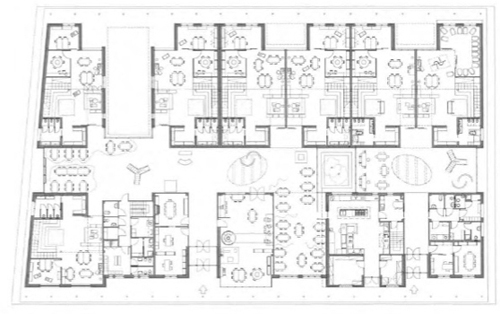 The building’s ground floor plan showing the typical Reggio spatial layout with the central square or ‘piazza’ as a shared common core, with all activity rooms leading off this space; serving the role of a public meeting space, where parents, teachers and children can come and meet each other. The space also serves as a dining area, with all the ages (1-6 years) coming together for this important social role (Dudek, 2007: 67). Reggio’s environments are treated as experiments in creating children’s spaces and the architecture is viewed as a backdrop to the children and their activities. It is spacious, elegant and decorated in a restrained manner so that is does not detract from the child’s artwork or activities (Dudek, 2007: 67). 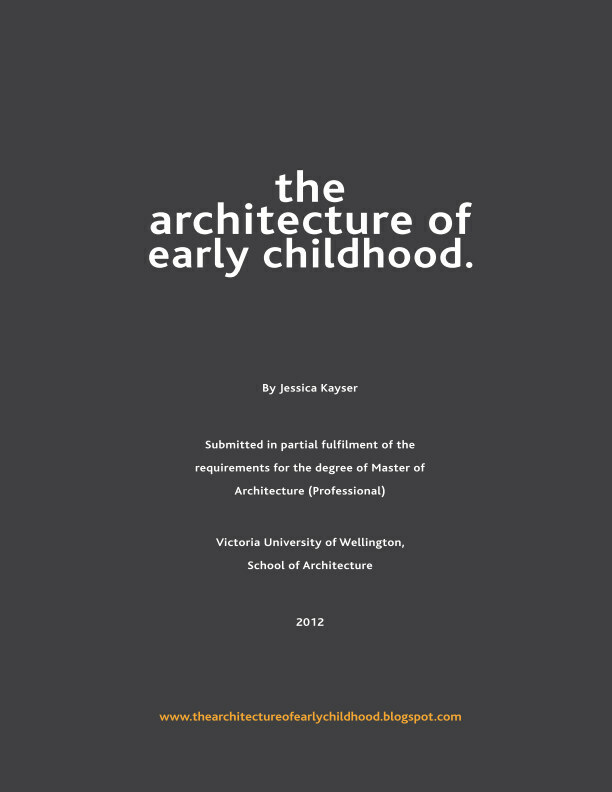 Much can be learnt from Reggio’s approach of serving the ‘compent child’ an appropriate architectural learning context. 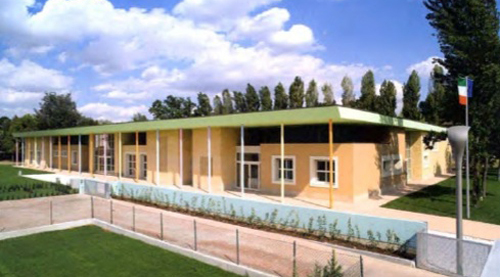 Via DesignShare, Dudek's (2007: 64-67) 'Schools and Kindergartens', and ZPZ Partners.